I have to say that despite all of the work, I had a really great time this year and am very glad that I was there. With my booth-mate Lisa being 8 months pregnant and me with my 3 month old little guy.. it really was a bit of a miracle that we actually pulled it off! 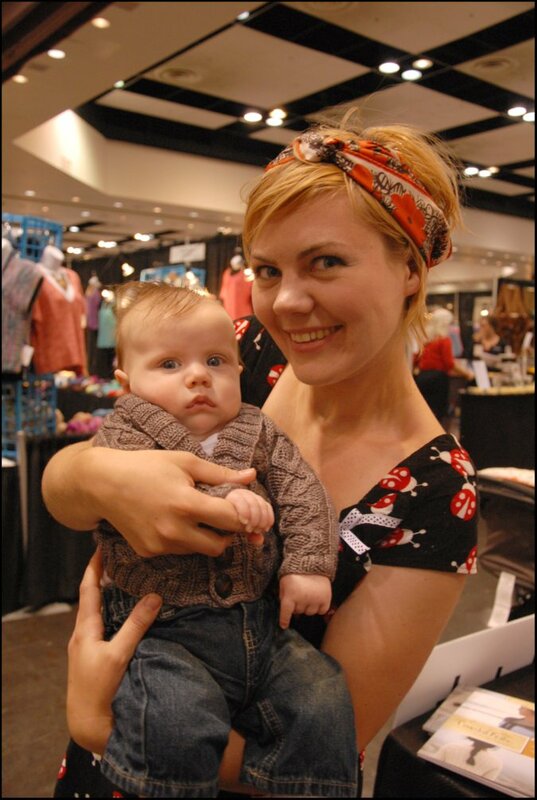 I brought the little guy to the booth with me as much as possible.. but come to find out.. babies don't really like knitting conventions. Weird. I know that he did, however, enjoy meeting Ysolda. 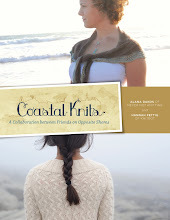 My favorite thing about this year was getting to see everyone's enthusiasm for Coastal Knits. I signed many books over the weekend which was very fun! 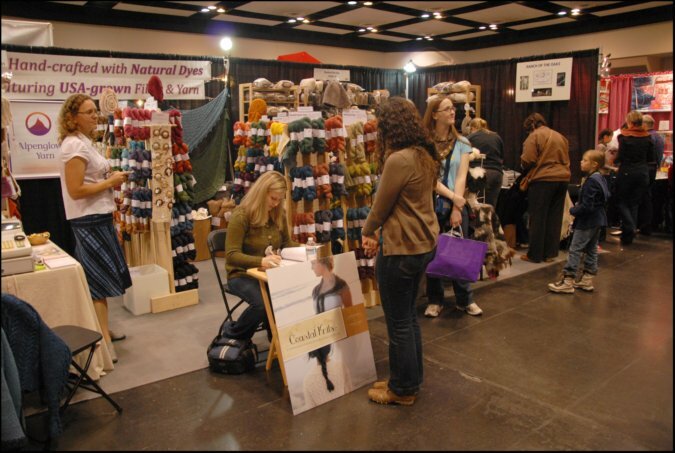 I also found many knitters around the convention center wearing their Coastal Knits garments. I tried to track down as many as possible for a picture. 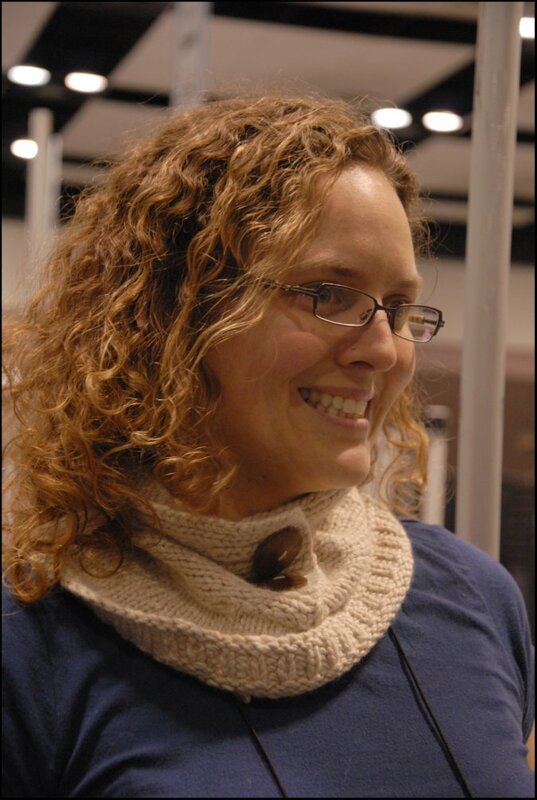 This last knitter pictured actually spun up all of the yarn for her Rocky Coast Cardigan herself! Didn't she do such a beautiful job? 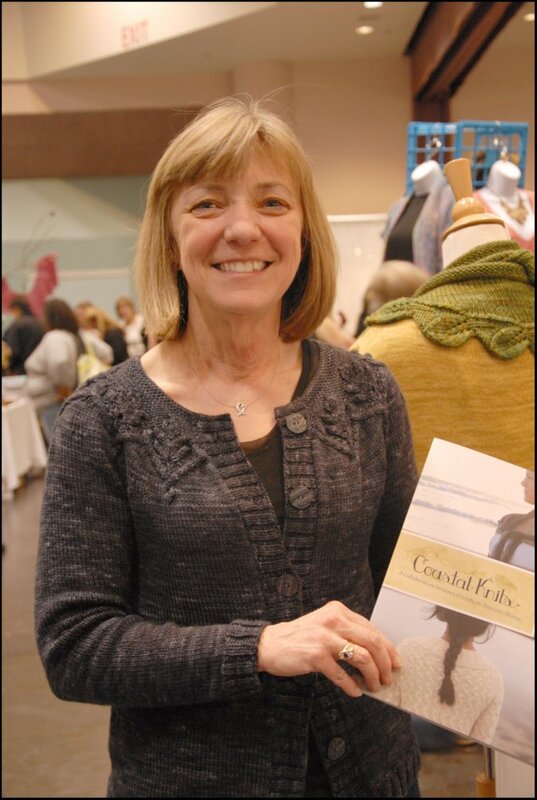 I loved hearing this knitter's story behind her Sand and Sea Shawlette. If you own a copy of Coastal Knits, you will know that this design was inspired by the incoming tide at Morro Strand Beach. Apparently this is the exact spot where this knitter's husband proposed to her. 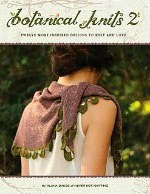 This shawl was a sentimental knit for her and she lovingly refers to it as her "engagement shawl". I thought that was so sweet. Rustling Leaves on Maia from Tactile Fiber Arts! And Ysolda took a liking to the Wildflower Cardigan that I had on display and wore it all day on Sunday. It looks so cute on her! She did give it back though.. so it was really more of a borrowing. Thanks to everyone who came up and said "hello" at Stiches this year. It was great to see all of you! Your booth looks beautiful - I am totally amazed (and impressed) that you were there with your 3 month old and that Lisa was there 8 months pregnant! 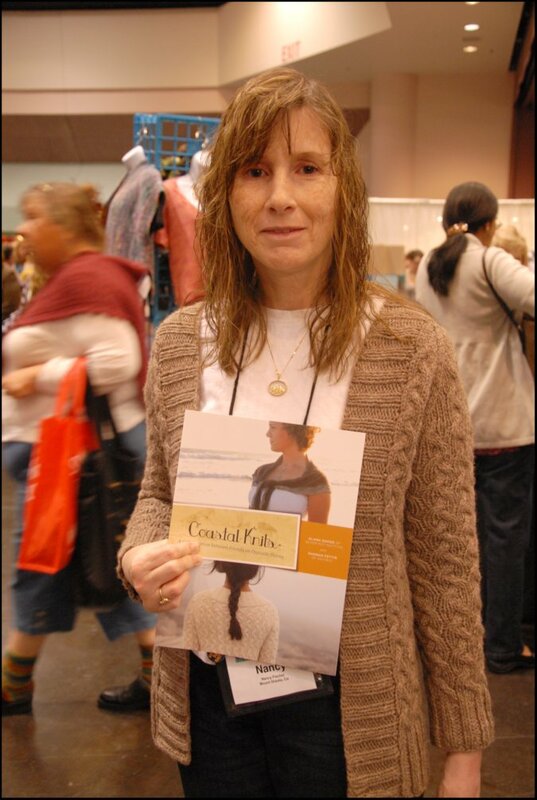 Love all the pictures of Coastal Knits in the wild. Your booth was one of my favorites this year. Thanks again for signing my book! 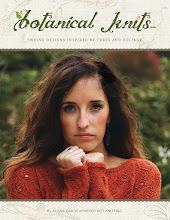 And after giving away my Gnarled Oak cardi, I think I'll have to make another for myself. It was a joy to knit. Your booth looks fantastic - well done for managing all that and a small baby!!! 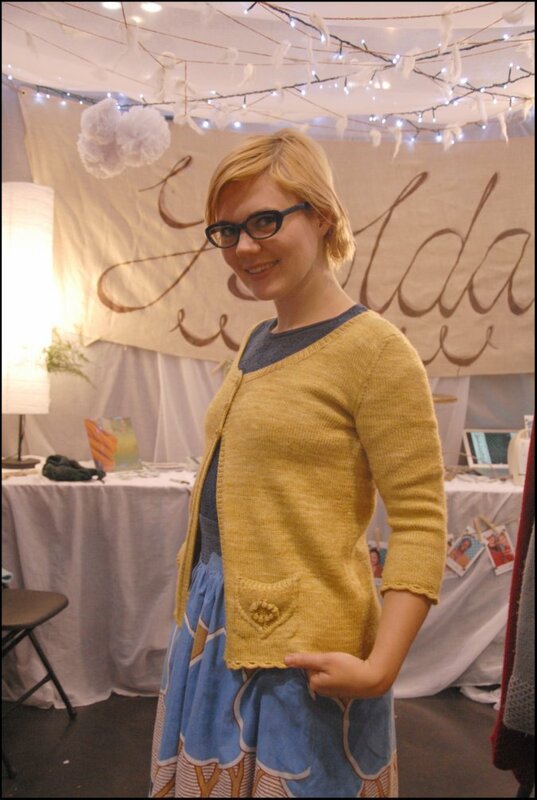 I thought that the cardy that Ysolda "borrowed" and the lemon waters edge cardy looked just lovely! Looks like a GREAT time! Now, I wish I would have made time to go-especially since I live right down the road. Oh well, there is always next year I guess. 1) I just finished a baby sized Gramps Cardigan (like, it's blocking as I type). So seeing your little guy in his made me happy. 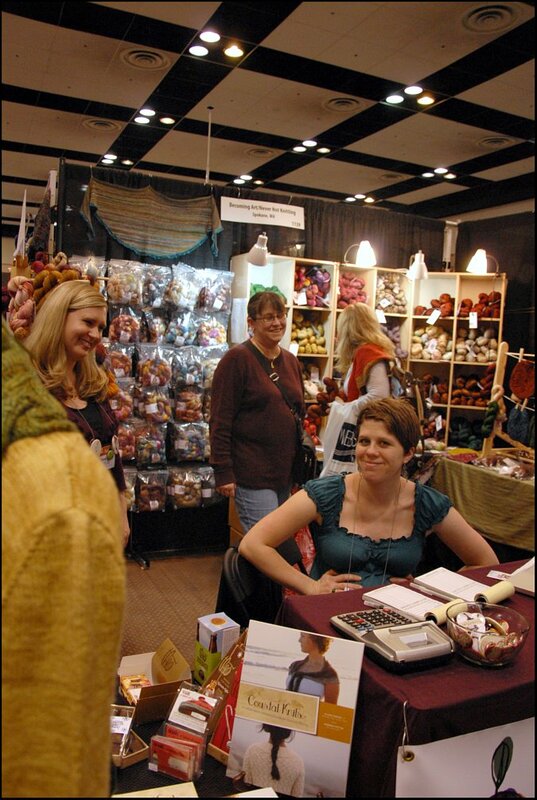 2) I've never been to a knitting convention, and your photos look so fun. 3) I love Ysolda and yes, if she steals your sweater, you let her get away with it, lol! 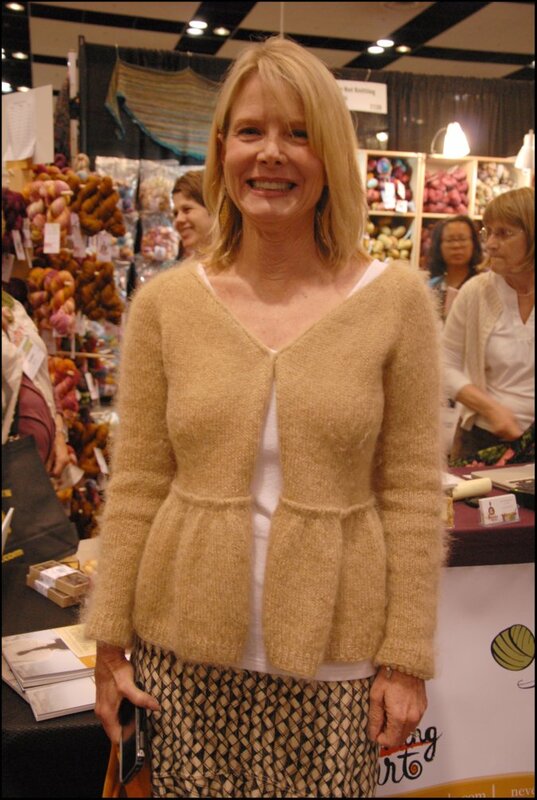 And of course she WOULD pick the Wildflower Cardi- with it's perfect blend of style, simplicity, and wimsy. Right up her alley I think. Congrats on a great booth. I wasn't there this year as I went to Madrona instead. Your baby is adorable ! Good thing Ysolda didn't decide to borrow *him*! I wish I could have gone to Mommy's NNK party. I'm so happy it was such a success for you. The photo of your little boy with Ysolda is just too precious! I think they're both a bit starstruck! 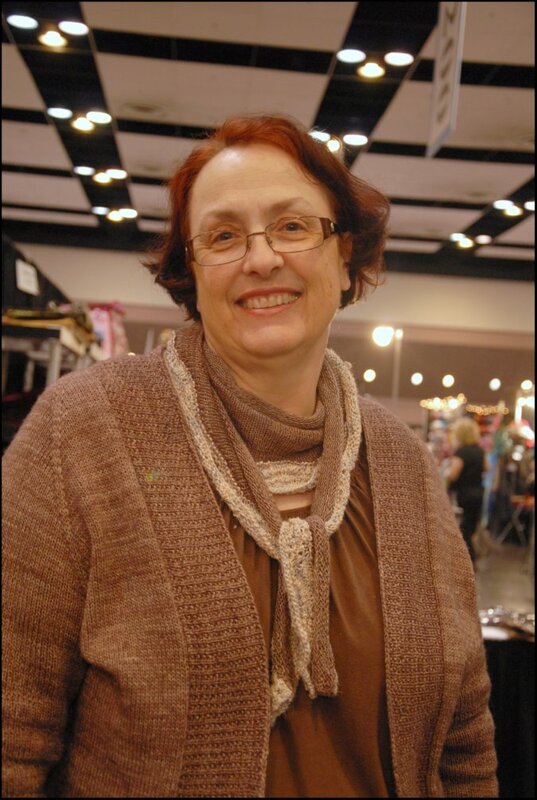 Loved meeting you and already have my yarn for the beret and gnarled oak cardigan. I plan to make the rocky coast sometime this year. Watch for it on Ravelry. looks like such fun...wish I could have gone! Wish I could have been there ... thanks for sharing all those wonderful pictures. 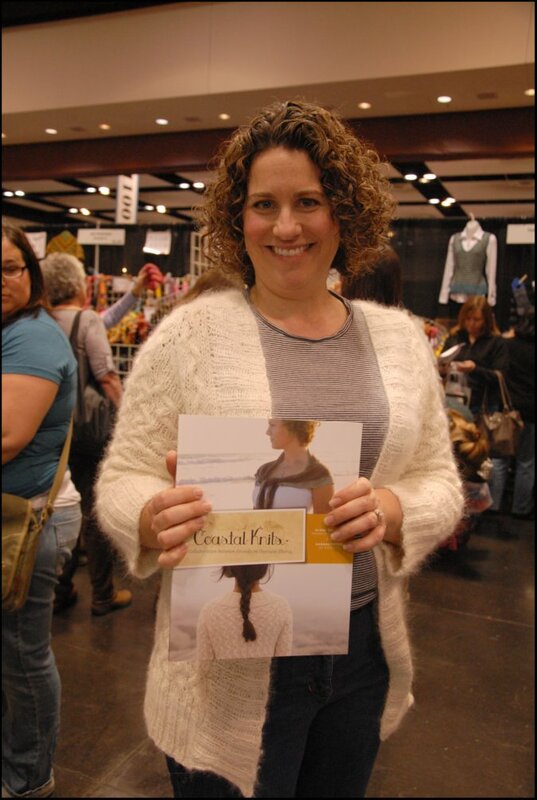 So nice to see all those knitters in their lovely Coastal Knits! Oh, I am so glad you were there too! Your booth was so pretty and so busy. I'm also amazed that as busy as you both are, you still pulled it off and looked effortless! 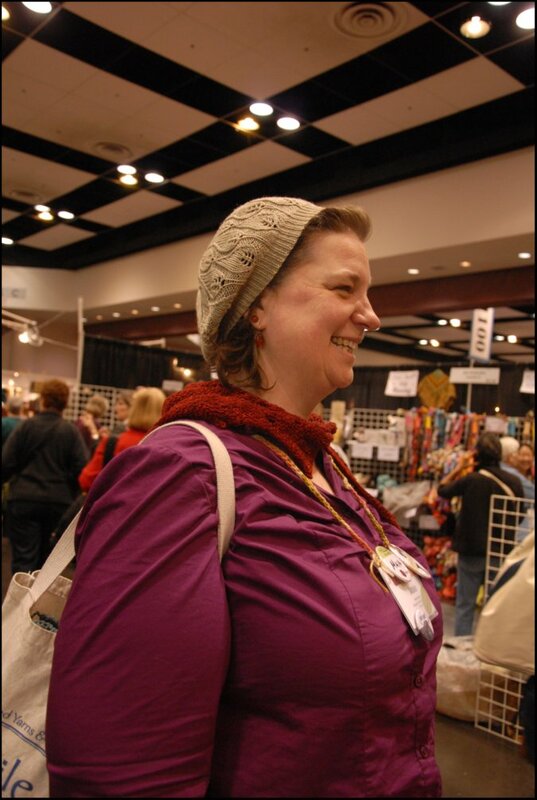 I'm glad I wore my Water's Edge, tho I had a few more from Coastal Knits that I could have worn! Wow! You must have had a wonderful time, and feeling so proud and happy seeing the designs knit up and worn by all these lovely ladies! Oh how lovely... you must have been in knitting heaven!! How great to see people in your designs - very inspiring. 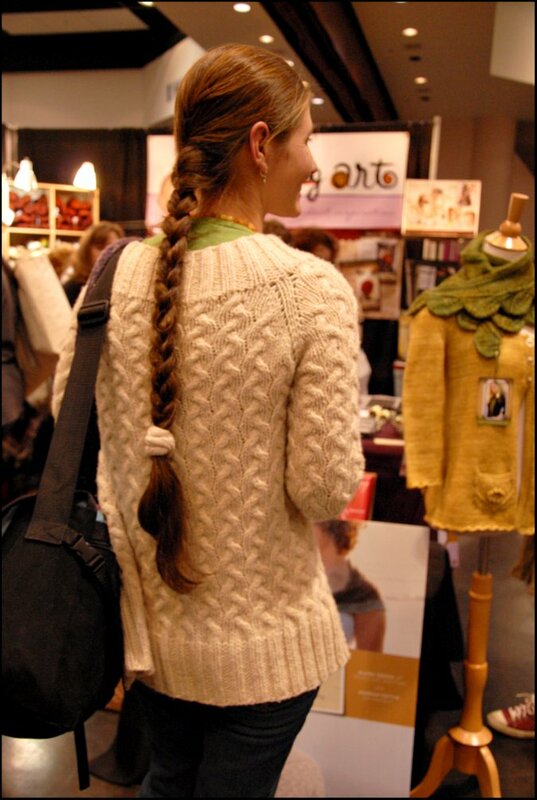 I love it when I've see my own handknits that I've sold actually being worn ...it really makes it all worth while. All of the examples from the book were wonderful. I can hardly wait 'til I get the time to begin one for myself - but now it's going to be 'OH SO HARD' to choose! I let out an audible wimper as i viewed the picture of your little guy with Ysolda. My heart just melted. He is so cute, and in that little sweater. Eek! so cute. looks like you had an amazing time alana! your knits look perfect on everybody! My husband and I both loved your booth! He wanted me to get you to sign some of the patterns we bought when we saw you, but I chickened out. Starting on the Seedling hat tonight! "Mommy's Never Not Knitting party"
oh, how I wish I could have seen you. My friend did get my book signed, so I'm quite happy about that. I'm still working on my rustling leaves, so perhaps I'll get that done in time for next year. I'm glad that you had a good time! 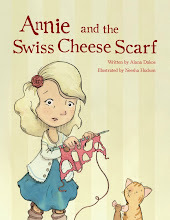 Bought your book at Rampunzel in Frankenmuth MI! Yeah...now to decide! Ooooh look at Little Man in his Gramps!!!! 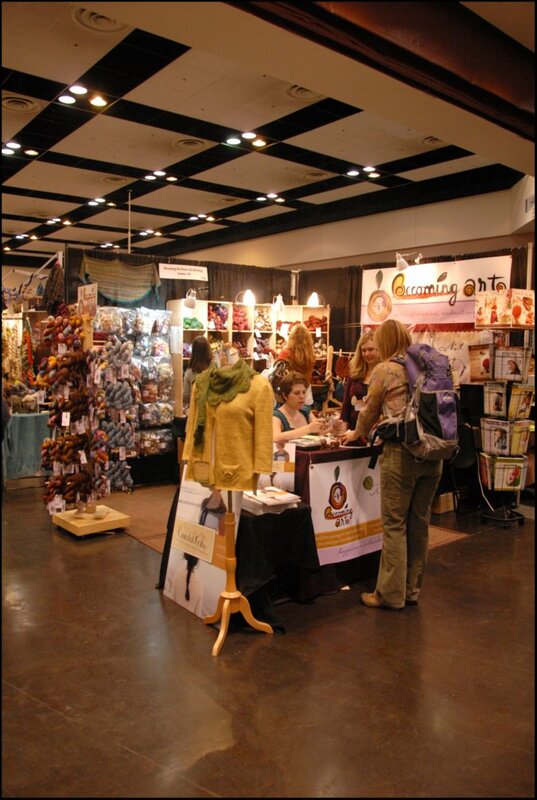 Your booth looks fantastic & how fun to spot all those Coastal Knits out and about. Because Elephants Need Scarves Too.